However, despite all the romance of that description, change is coming to Greenland. Initially that changed was marked by significant infrastructure improvements, implemented within the country’s towns over recent decades. 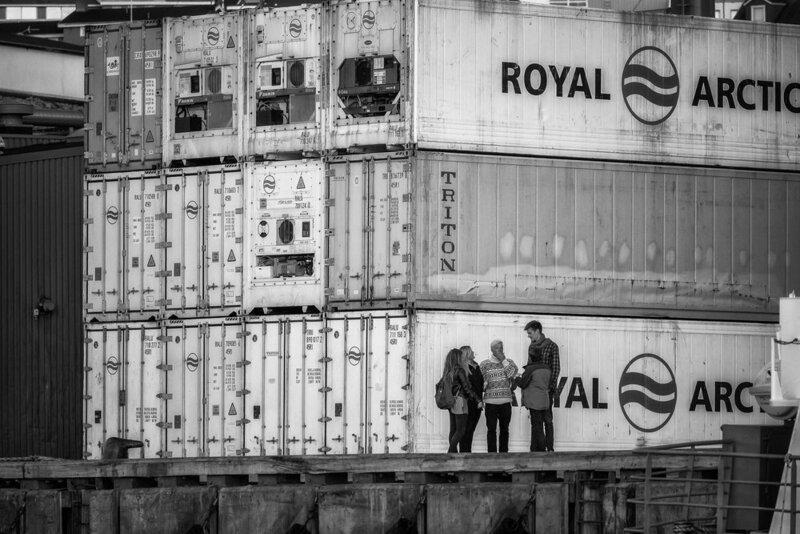 A stack of shipping containers provide an interesting background for a group of tourists on the docks of the harbour at Ilulissat, Greenland. More recently announcements of a huge mining boom is likely to bring to the country significant economic growth. Let’s all hope that the obvious compromises to cultural identity and the environment are not overly compromised by the promised advantages associated with such growth. All too often change comes at a price and many of the indigenous Inuit, whose lives are so intimately linked to the landscape in which they live, face great uncertainty over coming years. I was drawn to this interesting triangular shape in the middle of this collision of icebergs on the Ilulissat Icefjord in Greenland. 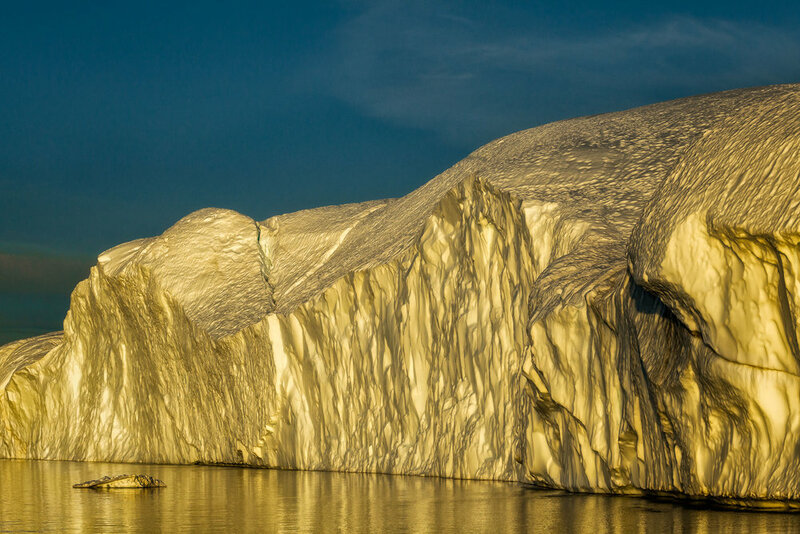 I made the photos in this post during a midnight cruise on the world famous Ilulissat Icefjord near the tourist town of Ilulissat in Western Greenland. It’s a most remarkable place where the Sermeq Kulalleq or Jakobshavn Glacier, the largest in the northern hemisphere, speeds into Disko Bay and towards the sea at around 40 meters a day during the summer months. It’s said that around 1/10 of the ice that reaches the sea from the inland ice comes from this glacier. In fact a massive 35 cubic kilometers of ice is calved off the glacier every year and into the 200-300 meter deep Ilulissat Icefjord. The sheer size and shapes of these great monoliths boggle the mind. The Icebergs are huge, but it’s the color they take on, reflecting the surreal light of the arctic sun at the edges of the day, that make the experience so wondrous. The cruise lasted around 2 hours during which time I managed to stay on deck for all but around 10 minutes. It was windy and cold but being inside, undercover, felt a little too much like watching nature on a TV screen from the comfort of your own living room sofa. When I did venture inside, to check on my travelling companion, I was amazed to see that nobody seemed to be taking more than a cursory glimpse out of the window. I couldn’t believe it, nor could I wait any longer. That kind of attitude is like a disease. I had to get back out on deck and start living again. And I’m so glad I did. I loved my time in Greenland and look forward to returning again to see more of this most spectacular country. It’s a long way from Australia so, for anyone travelling from this neck of the woods, consider spending some time in either Iceland or the Faroe Islands on route. You’ll be so glad you did. All three countries offer spectacular opportunities for landscape photography, yet all are unique destinations that are very different from each other. That’s why it makes sense to include at least two of them in your itinerary.